Thailand is steeped in history and unique culture. It is believed Thailand’s history stems from the Bronze Age some 5,000 years ago. Recorded history indicates a number of periods that mark important stages in Thailand’s history – the Sukothai Period from 1238 to 1438, the Ayutthaya Period from 1351 to 1767, the Thonburi Period from 1767 to 1782, and the Rattanakosin Period from 1782 until the present. The legacy of each of these periods is a series of temples, shrines, palaces and ancient sites, all depicting unique Thai architectural styles and lavish design. Although some of the historical significance of these attractions may at times be lost on you, the visual feast you experience more than compensates for your lack of insight. Simply relax and soak in the sights and sounds and build unforgettable memories. SERENATA Hotels & Resorts has a variety of cultural and historical resorts for you to experience starting from the ancient Sukhothai period, Lanna age in northern Thailand, the local living of Hmong tribe and one of the world recognized history in River Kwai, Kanchanaburi.Thailand is steeped in history and unique culture. It is believed Thailand’s history stems from the Bronze Age some 5,000 years ago. Recorded history indicates a number of periods that mark important stages in Thailand’s history – the Sukothai Period from 1238 to 1438, the Ayutthaya Period from 1351 to 1767, the Thonburi Period from 1767 to 1782, and the Rattanakosin Period from 1782 until the present. The legacy of each of these periods is a series of temples, shrines, palaces and ancient sites, all depicting unique Thai architectural styles and lavish design. Although some of the historical significance of these attractions may at times be lost on you, the visual feast you experience more than compensates for your lack of insight. Simply relax and soak in the sights and sounds and build unforgettable memories. SERENATA Hotels & Resorts Group proudly presents our most fascinating cultural and historical resorts, perfectly designed to experience Thailand’s impressive history and local living. Surrounded by wreck of ancient remains and only a few minutes away from Sukhothai Historical Park – a UNESCO World Heritage, The Legendha Sukhothai, located in Sukhothai province, Northern Thailand, is one of the finest resorts in Sukhothai. Exteriorly The Legendha Sukhothai is decorated as Thai traditional village-like landscape, whereas interiorly decorated as Thai contemporary design with 64 spacious rooms. The Legendha Sukhothai uniquely presents a feeling and experience of authentic Thai Sukhothai stay which you cannot find elsewhere. The charming Le Charme Sukhothai, is a newly Thai-styled resort in Sukhothai, Northern Thailand. The resort uniquely provides an “emotional break” concept from Sukhothai’s ancient remains ambience with 40 brand-new vivid villas nestled by lotus ponds and tropical garden. Le Charme Sukhothai, further, is located only five minutes away from Sukhothai Historical Park, UNESCO World Heritage. The perfect harmony between “emotional break” concept and Sukhothai ancient culture leads Le Charme Sukhothai to the most appealing destination in Sukhothai. The Legend Chiang Rai is the grand contemporary Thai Lanna styled resort that lies along the Mae Kok River, secluded from Chiang Rai, Northern Thailand, yet only a few minutes’ drive from the city centre. The grand architecture of The Legend Chiang Rai gives the feeling of the Thailand’s 7th century and, further, the property has a panoramic view of the near-by hills and mountains. The riverside at backyard is rich with large rain trees and lush vegetation. Facilities and services are at most of top hospitality service can be. All of its uniqueness brings the resort the region’s “Legend” that provide you the unforgettable holiday experience. Cradled in a scenic valley of the Suthep-Pui mountain range, north-west of Chiangmai of northern Thailand, Hmong Hilltribe Lodge provides you a unique opportunity to experience traditional Hmong culture amidst striking natural beauty. Conveniently located in the Mae Rim district, only an hour drive from Chiang Mai, our jungle lodge combines simplicity and style to create an environment of rustic elegance and serenity. With an elevation of 2,700 feet above mean sea level, the weather at Hmong Hilltribe Lodge is pleasantly mild and cool all year round. 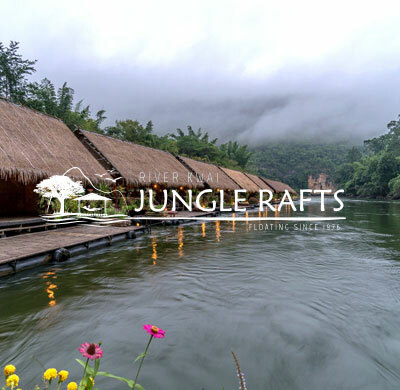 Founded in 1976, River Kwai Jungle Rafts is the stunning floating houses on the world’s historic river, River Kwai, in Kanchanaburi province, Thailand. River Kwai Jungle Rafts uniquely provides unforgettable experiences whilst embraced by tropical nature with magnificent mountain, and legendary river flows underneath your bed. Experience the distinguish presence of Mon culture, and amuse the beauty of hundreds of candle lights at night. As its uniqueness, River Kwai Jungle Rafts is proudly awarded as “Unseen Paradise” recognized by the Tourism Authority of Thailand, which exceptionally ensures the unparalleled gateway and the “must visit” destination of River Kwai Jungle Rafts.